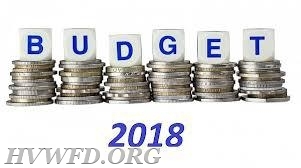 The annual budget hearing for the 18/19 fiscal year will be held on June 28, 2018 at 7:00 pm. The location is the Hope Valley-Wyoming Fire District meeting room at 996 Main Street, Hope Valley RI. Please view the attached file for further detail about the hearing and about District positions up for election. For further information please contact the Hope Valley-Wyoming Fire District in person at 996 Main Street, Hope Valley RI or via phone at 401-539-2229.